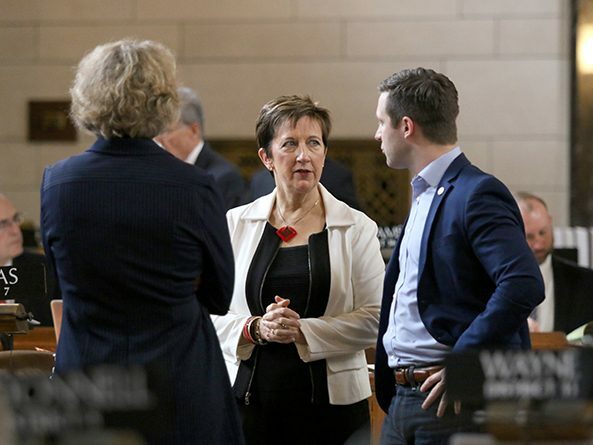 Lawmakers made a second attempt March 23 to end debate and advance a bill to make adjustments to the state’s mainline budget. LB944, introduced by Speaker Jim Scheer of Norfolk at the request of the governor, contains funding adjustments for state aid to schools and the operation of state agencies for the current fiscal year and FY2018-19. Following extended debate March 21 on a provision regarding the disbursement of Title X funds—federal grant dollars that are used to subsidize reproductive and preventive health services for low-income individuals—an attempt to invoke cloture and vote on the bill fell three votes short. Lincoln Sen. Patty Pansing Brooks offered an amendment to strike the Title X language from the bill when select file debate resumed March 23. Following two hours of debate, a second attempt at cloture failed on a vote of 31-7. Thirty-three votes were required. No vote was taken on the Pansing Brooks amendment. It and several others are pending. Scheer urged lawmakers to negotiate a compromise over the weekend in order to advance the budget and move on to other legislation.